Readers who do not live in the UK might want to look at the supermarket-chain Sainsbury’s Christmas advert before reading this blog. It can be viewed here. The current Sainsbury’s Christmas advert offers the perfect example of a commercial rewriting of history to present beautifully crafted film as if it was historical truth. Done in the best of taste, with the blessing of the Royal British Legion, Sainsbury’s message is about gift giving in the expectation of an increased market share for the company. It is sentimental and sugary-sweet. The trenches are deep and crisp and even seem to have nicely spaced-out lamps. 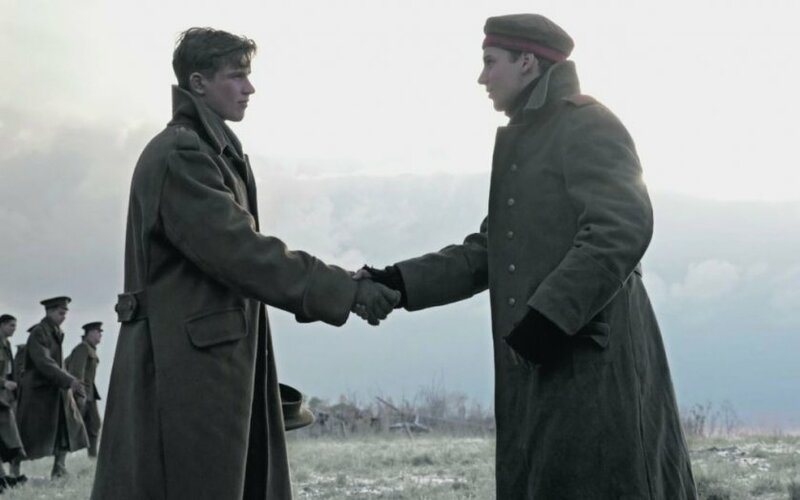 Handsome soldiers with perfect teeth smile through comfortable clean clothes and heavy overcoats as they gingerly extend their hands in friendship towards the enemy. There is an overwhelming sense of humanity and a hint that the ordinary soldier saw no point in the carnage that had already been raging for four bloody months. No evil in sight; it is Disney World history. 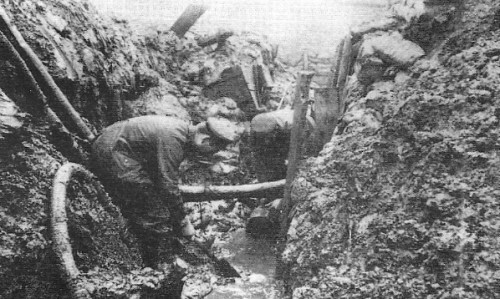 As both sides settled into the stalemate of that first winter campaign, soldiers faced long, wet, dark days with daily artillery fire to deepen depression. Honour and glory were stuck in the oozing mud, and legs rotted into black with false frostbite ‘until many of them were carried away with bronchitis and pneumonia’. These very decent men from good clean homes struggled relentlessly against the lice and vermin that invaded their privacy. New enemies with strange names like cerebo-spinal meningitis sent shudders down the line, and a sense of hopelessness replaced the early expectation of a quick victory. Pity then, that the Sainsbury’s version is so clean-cut and sterilised with no sense of hardship and squalor. Little wonder that a spirit of goodwill descended over the trenches with the Christmas mists in Flanders as a truce of sorts broke out along sections of the front line not far from Ypres. (Tour guides take visitors to impromptu road-side memorials every day) In some parts it lasted for more than twenty-four hours; not so in others. The cease-fire was not continuously observed, but despite the fact that any man who first put his head above the parapet was taking a risk, groups of officers and men from both sides cautiously stepped out of their trenches and met an enemy with whom they shared common ground. 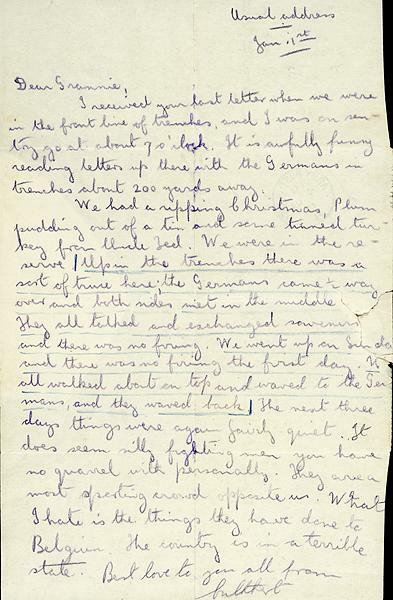 Letters sent from the front and published in the Times around New Year, recorded the amazement of British officers, men from the Royal Field Artillery, the Leicestershire Regiment, the London Rifle Brigade, as well as Scottish, Irish and Welsh regiments, that this spirit of cautious trust, blossomed, albeit briefly, into a temporary peace. A Major in the Leicesters found the Germans ‘jolly cheery fellows for the most part, and it seems so silly under these circumstances to be fighting them.’  Men were later imprisoned for such treacherous sentiments. An officer from the Rifle Brigade was astounded to find the German trenches on Christmas Eve bedecked with lanterns looking like ‘The Thames on Henley Regatta Night,’ and thought that three quarters of the German army were ‘very young youths’. An Army Medical Corps Major wrote of the ‘sing-songs’ which ended with both sides rendering ‘God Save The King’, and a football match which ‘the Saxons’ (Germans) won 2-1. Clearly, both sides enjoyed the universal appeal of football under impossible conditions. ‘We had an inter-platoon game of football in the afternoon, a cap-comforter stuffed with straw for the ball, much to the Saxons’ amusement.’  The Sainsbury’s advert caught that part of the story well. At least four football ‘matches’ were reportedly played between British and German troops, and the Glasgow News reported a 4-1 victory for the Argylls. But look at the vocabulary. These Germans weren’t ‘Huns’, they were ‘Saxons’, men who had similar historical family roots, including of course, the King and the Kaiser. The satyrical magic of Joan Littlewood’s magnificent Oh! What A Lovely War, was best caught towards the end of the football game when the ‘match’ was interrupted by the sound of heavy guns symbolising an end to the truce. The awkwardness was broken by a small Scotsman who rasped, “That’s the bloody English”, with an inferred responsibility which was definitely unfair. But this truth is clear. British Military Headquarters issued orders forbidding any ‘truce’ with the enemy. What happened was illegal and dangerous in the minds of the warmongers. This is the second major failure in Sainsbury’s advert. It fails to capture any sense of disobedience, of a solidarity between men from both sides which defied clearly expressed orders. The British Military Commanders, and those who operated above them, gave strict instructions that there would not be ‘anything of the nature of a truce’. All ranks were reminded that ‘war is war, and the Germans invariably have some sinister motives in all they do, especially under the guise of a gush of friendly sentiment.’ This order was issued on 21 December from British Headquarters and reported abroad by Reuters. The Generals could see the danger. If men laid down their weapons all along the western front, the war would collapse. Had it grown to a mutiny, governments would have fallen. Profits would have plummeted. That was the backdrop on which Sainsbury’s had no wish to focus attention. 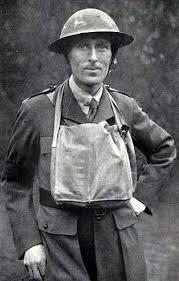 Philip Gibbs, the war correspondent for the Daily Telegraph and the Daily Chronicle, was renowned as a journalist who told it as it was. He recorded the full horror of the first world war and faced the wrath of arrogant Generals who arrested him four times and attempted repeatedly to censor his reports. He fought his own battle against the military brass whom he famously described as having ‘the brains of canaries and the manners of Potsdam.’ Gibbs saw that British soldiers held no great bitterness against the Germans, trapped like themselves in trenches barely a hundred yards away; an enemy that was enduring the same misery during that winter of 1914. In his wonderfully observed record, The War Dispatches, Gibbs wrote warmly about the sense of comradeship amongst men who did not want to kill each other but lived under the spell of ‘high distant Powers who had agreed this warfare’. They were caught in someone else’s war, sacrificed like gladiators in the Roman amphitheatres who had to kill or be killed by their owners. They were all victims; all expendable. At that moment in time these British and German men, standing together in the mists of Flanders, took photographs, arm in arm, exchanged cigarettes, sang …and cursed the war. The Times of 23 December 1914 painted a thoroughly positive, nearly joyous, account of Christmas plans at the front. How the men who stayed at home must have cursed their luck that they were not in Flanders. Army units were reported to be making their own arrangements on a very extensive scale. One corps was said to have ordered 700 chickens from Paris and proposed to serve every man with half a chicken ‘ hot from the field kitchens’. What luxury. ‘The authorities’ were reported to have arranged for sufficient plum puddings for every man to have half a pudding to himself. Whether everyone was so fortunate, we do not know, but one letter home did mention ‘tinned plumb pudding sent from Uncle Jed’. According to The Times, supplies from home of these seasonal luxuries were so colossal that workers in the Field Post Office were buried chin-deep in parcels. Such propaganda was, of course, for home consumption, but we are left with the nagging feeling that Sainsbury’s may well have missed a trick in not promoting sales of chicken and plum pudding. And what of the Germans? At this early stage of the war the ‘Boches’ were depicted by the British propaganda machine as spiteful, vindictive and mean. The Times dismissed stories about German difficulties in providing sufficient Christmas rations for their soldiers, but boasted that ‘it is quite safe to say that they will fare very much more frugally than our own men.’ The report warned that British soldiers should take great care because the Germans would want to spoil ‘the other fellow’s enjoyment’ by strafing the trenches. Such behaviour, they described as ‘a good sound, Hunnish axiom’. To the ranks of the elite the enemy were ‘Huns’; in the ranks of ordinary men, they were ‘Saxons’. An interesting divide indeed. What the middle-classes read in the comfort of their warm coal-fired homes was as far from reality as possible. The lads were to be served hot christmas fare including half a chicken and plum pudding. Really? The stale biscuit which Sainsbury’s went to commendable lengths to reproduce for their advert, was the more likely fare for the ordinary soldier, though in that first Christmas of the war there was more to go round. The Christmas message from the Anglican pulpits of christian justification struggled to marry the concept of peace and the raging war. 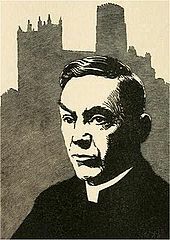 Hensley Henson, the Dean of Durham preached proudly that ‘the battlefield became radiant with moral witness when its carnage was transfigured by unselfish devotion and its anguish was mitigated by ministries of love’  Such meaningless nonsense may have sounded fine in the hallowed halls of Durham, but it bore no semblance to the reality of the trenches. In all the nonsense of this propaganda, the final line in The Times article of 23rd December stung like the bitter poison of a profound lie. According to their report, the order to avoid fraternising with the enemy was greeted with ‘unanimous and cordial approval in our trenches’. It was not. Nor did the spirit of the ‘Christmas Truce’ wither in the days that followed. Philip Gibbs recognised that although ‘it became so apparent that army orders had to be issued stopping such truces’ they were not always obeyed. Local truces, and what he described as ‘secret treaties’, were agreed by which soldiers agreed to keep up the appearance of constantly shooting at each other without actually targeting the enemy. It could not last. Units were changed. New officers came up the line. And so the first Christmas and New Year of the war passed into history and the mythology of times rewritten. Men were once again coerced to massacre each other by powers beyond their ken. The Sainsbury’s advert sadly misses the point. In the filthy inhumanity of trench warfare decent men wanted peace. They wanted the war to stop. They wanted to go home. At the same time the British public were fed propaganda to sustain an appetite for prolonging the ‘just’ war. Powers that could not be challenged ordained it so. Sainsbury’s Christmas 1914 advert projects the sterilised image which official histories want us to believe. No attempt has been made to analyse why this happened; why brave men on both sides of the divide were sacrificed. Be assured, there will be no Christmas 2015 advert in similar vein. The High Command on both sides made sure in 1915 that every soldier knew the severe cost of fraternising with the enemy. Philip Gibbs, The War Dispatches, p. 81. The Times, 2 January, 1915, p. 3. Bob Holman, The Sunday Herald, 31, November, 2013, pp. 26-28. 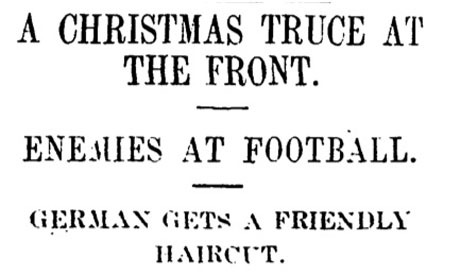 The Times, 23 December 1914, p. 7. The Times, 26 December 1914, p. 3. Philip Gibbs, The War Dispatches, p. 83.